How much does it cost to travel to Jerusalem? How much money will you need in Jerusalem? ₪282 ($79) is the average daily price for traveling in Jerusalem. The average price of food for one day is ₪91 ($25). The average price of a hotel for a couple is ₪311 ($86). Additional pricing is in the table below. These average travel prices have been collected from other travelers to help you plan your own travel budget. How much money do I need for Jerusalem? Jerusalem is the capital city of Israel, as well as one of the most historically rich cities in the world. It is also the largest city in the country. While Tel Aviv holds many of the responsibilities of a capital city, officially, Jerusalem is still considered the capital. It is important to note that most countries have their embassies in Tel Aviv, not in Jerusalem. Jerusalem is also a holy city for three religions: Judaism, Islam, and Christianity. Many visitors come to Jerusalem as part of a religious journey. The city is filled with strong beliefs and passionate people with a rich and incredibly diverse culture. The main languages in the city are Hebrew, in western Jerusalem, and Arabic in eastern Jerusalem. English is also very common throughout the city, particularly in the Old City. Jerusalem's climate is Mediterranean with hot and dry summers and mild and wet winters. January is the coldest month with the average temperature about 48 degrees Fahrenheit. Snow flurries may occur a couple of times a year and heavier snowstorms happen every few years, but snow does not linger on the ground for long. July and August are the hottest months with the average temperature in the mid 70s Fahrenheit. The summers are incredibly dry. Jerusalem has an endless supply of sights that are significant to many different religions. It's virtually impossible to see every major sight in the city during one visit so it is best to prioritize your options. You should come prepared with a quality guide book that can give you information on each sight, its history, and its significance to various religions. Some of the must-see sights in Jerusalem include Mar Elias Monastery, Tantur Theological Center, St. Simeon Monastery, Ramat Rachel Archaeological Site, Monastery of the Cross, the Israel Museum, Yad Vashem, The Garden Tomb, The Palestinian Heritage Museum, The Biblical Zoo, and Mount Herzl. Within the Old City you'll find the Church of the Holy Sepulchre, The Temple Mount, Al-Aqsa Mosque, and Qubbat Al-Sakhra (Dome of the Rock), and the Western Wall. In addition to visiting the religiously important sights, you should also allow yourself time to simply walk through the Old City and other neighborhoods of interest. In addition to being a city of such religious significance, Jerusalem is also a fun city to explore in and of itself, and you should not miss this experience while you're here. Jerusalem has many different districts, but as a tourist you are most likely to spend the majority of your time in the Old City. The Old City is still surrounded by a wall and has many places of significance for Muslims, Christians, and Jews alike. 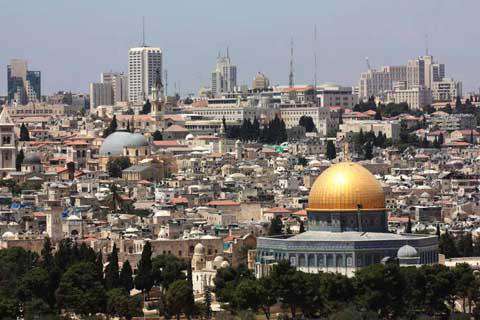 West Jerusalem (or New Jerusalem) is the Jewish-Israeli part of the city as well as the commercial center. East Jerusalem is considered by many Palestinians to be the capital of Palestine. It was claimed by Israel during the Six Day war of 1967 and taken from Jordan. Today there are approximately 200,000 Jews and most of the city's Muslim and Christian populations (about 250,000 people) that reside there. Me'a Shearim is famous as the home of the ultra-Orthodox Jewish population. If you visit this area you should respect the population and dress modestly. Ein Kerem is a neighborhood in West Jerusalem that has a unique village atmosphere. It is also a popular place for artists and sculptors. Arranging a tour of Jerusalem can greatly enhance your experience. The city is filled with history, and without a proper guide or guide book, you'll miss out on much of the meaning of each sight. There are a variety of organizations that offer tours around the Old City. Many should be arranged in advance. Jerusalem is a large and culturally diverse city with food from all over the world. You can find restaurants that offer everything from Mediterranean, Middle Eastern, European, American, or even Ethiopian cuisines. Budget food options include the falafel stands that are found all around town, bagel shops, and fast food restaurants. Sit down restaurants are more expensive than you might expect and dining out can quickly drain your budget. If you want to prepare your own meals, there are several excellent markets around the city. There are also many smaller food shops concentrated in the Old City. Jerusalem is a city with many neighborhoods, and while it's easy to walk around most neighborhoods, to go any significant distance you will need some other form of transportation. Taxis are readily available and generally reasonably priced. They operate on a meter so the price should be predictable. Buses are another wonderful option for traveling around Jerusalem. They can be quite crowded, but they are frequent and cheap. Buses are usually dark green in color and the drivers stop frequently. The system is comprehensive and travels to most parts of the city. Jerusalem also opened a light rail system in late 2011. It currently connects the northeastern areas to the southwestern areas along the western side of the city. There are plans for additional lines to open in the future. The system goes near several areas of interest for tourists including Damascus Gate, Saffra Square, Jaffa Gate, Ben Yehuda Stree, and many of the city's main markets. There is a tram line that runs along Yaffo Street and passes by many cafes and shops as well. Go to Ein Gedi and the Dead Sea from Jerusalem. Public buses are frequent and easy to catch so there's no need to take a tour. Spend the morning hiking through the waterfalls in Ein Gedi and the lounge by the Dead Sea in the afternoon. If you're looking for a cheap hostel or place to stay in Jerusalem, check out the New Swedish Hostel. It's not really new, nor is it Swedish, but it's a good place at a great price. They have a large room with a lot of dorm beds, and private rooms with doubles and triples in the back and upstairs. It's in a great location right in the middle of town off of the main "street" that runs east-west through the middle of the old town. From the Jaffa gate head straight into old town, down the gradual stairs that are this main road, and it will be on the left after a hundred meters or so. It has a kitchen, internet, and a TV room. If you stay a few days or more, get to know the guy at the front desk. He'll mellow out with time.